If you choose to continue to buy The Sun after reading this article, and the articles it links to, then you ought to stop calling yourself a Liverpool supporter. Collect any shirts or scarves you have, and hand them in to a charity shop. In fact you can’t really call yourself a football supporter. The lies printed in The Sun that you will read about below were aimed at Liverpool supporters, people from Liverpool, people from the North of England, football supporters of any club. If you fall into any of those categories you certainly shouldn’t be buying, reading, or visiting the website of that newspaper. If you are a decent human being you will be steering clear of it from now on, even if you’ve not done so before.. If you buy the paper regularly already, print off all of this information, and save your money tomorrow. Read these articles instead. If you still want to buy that paper the following day I would be surprised.. 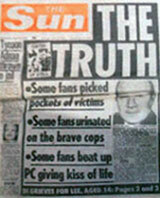 The boycott of The Sun goes back to April 1989, over 20 years ago. On April 15th 1989 a disaster took place which resulted in the deaths of ninety-six Liverpool supporters at Hillsborough, the home ground of Sheffield Wednesday, during an FA Cup semi-final between Liverpool and Nottingham Forest. Ninety-six people had their lives crushed out of them. Many more are said to have ended their own lives since as a consequence of that disaster. A lot of injustices came out of that disaster, far too many to list here. For more information visit the Hillsborough Justice Campaign website at http://www.contrast.org/hillsborough and please try to support them.. This article concentrates on one piece of injustice that could so easily have been avoided. That could so easily have been made a little better, if not fixed, in the intervening years. Lies were printed as fact in a British newspaper, and that newspaper has still not made an unconditional apology for what it printed. Its editor of the time has never made an unconditional apology in all of that time.. The headlines and sub-headlines on the front page of The Sun newspaper on the Wednesday following the disaster were as follows:. Some fans urinated on the brave cops. Some fans beat up PC giving kiss of life.”. So just four days after their loved ones had died, four days after they had narrowly escaped death themselves, Liverpool supporters were confronted with those headlines. People actually believed those headlines. Those who were there did not believe the headlines of course, nor did those who knew people who had been there. Unfortunately though a lot of people did believe those headlines; people who were not Liverpool supporters, perhaps supporters of another team or people who did not follow football at all. 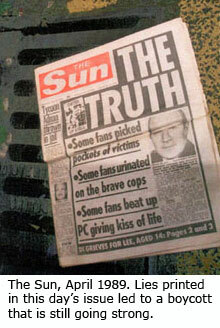 The headlines sewed seeds in so many people’s minds that the 96 supporters died at the hands of their own kind. All lies, all proven to be lies, yet never put right by that publication.. The Wikipedia article says: “The story accompanying these headlines claimed that ‘drunken Liverpool fans viciously attacked rescue workers as they tried to revive victims’ and ‘police officers, firemen and ambulance crew were punched, kicked and urinated upon’. A quote, attributed to an unnamed policeman, claimed that a dead girl had been abused and that Liverpool fans ‘were openly urinating on us and the bodies of the dead’.”. Read that last bit again, it really was printed in a national newspaper..
Liverpool legend and the manager of the club at the time Kenny Dalglish was greatly affected by the tragedy. He attended numerous funerals and visited people in hospital, some of whom were in comas; he spent time with those that had lost their loved ones. In his autobiography he talks about the Disaster and recalls the media coverage:. “The press coverage was difficult to comprehend, particularly the publication of pictures which added to people’s distress. There was one photograph of two girls right up against the Leppings Lane fence, their faces pressed into the wire. Nobody knows how they escaped. They used to come to Melwood every day, looking for autographs, and that photograph upset everyone there because we knew them. After seeing that I couldn’t look at the papers again.. When the Sun came out with the story about Liverpool fans being drunk and unruly, underneath a headline ‘The Truth,’ the reaction on Merseyside was one of complete outrage. Newsagents stopped stocking the Sun. People wouldn’t mention its name. They were burning copies of it. Anyone representing the Sun was abused. Sun reporters and photographers would lie, telling people they worked for the Liverpool Post and Echo. There was a lot of harassment of them because of what had been written. The Star had gone a bit strong as well but they apologised the next day. They knew the story had no foundation. Kelvin MacKenzie, the Sun’s editor, even called me up..
“How can we correct the situation?” he said..
“You know that big headline – ‘The Truth’?” I replied. “All you have to do is put ‘We lied’ in the same size. Then you might be all right.”. Mackenzie said: “I cannot do that.”. "Well,” I replied, “I cannot help you then.”. That was it. I put the phone down. Merseysiders were outraged by the Sun. A great many still are.. There is no excuse for buying or reading The Sun. None whatsoever. If you read that newspaper, or worse still you buy that newspaper, after reading this article and those other articles that are linked to, then you are not fit to call yourself a Red. If you support another team, you should still be able to see why that newspaper should be boycotted. No matter what competitions they are running. Regardless of any “exclusives” they claim to have, even if it is the only paper left in the shop. Saying you bought it to get some tokens to help your daughter’s school to buy a new computer is not going to get you off the hook. It’s really simple:.